Railpictures.ca - Mike Molnar Photo: CN A438 eases its way along the Chrysler Spur towards the Chatham Subdivision in Windsor. Ironically, this spur used to service the Ford Essex Engine Plant before they cancelled rail service several years ago. | Railpictures.ca – Canadian Railway Photography – photographie ferroviaire Canadienne. 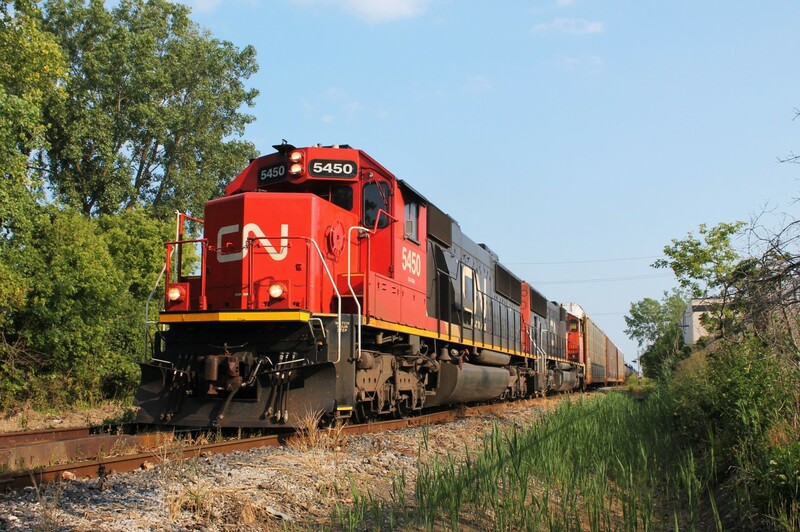 Caption: CN A438 eases its way along the Chrysler Spur towards the Chatham Subdivision in Windsor. Ironically, this spur used to service the Ford Essex Engine Plant before they cancelled rail service several years ago. Thank you! I too like these units a lot. 438/439 usually have SD75Is so anything but is always nice to see down here. I sure do like the looks of the ex-Oakway SD60′s. You did a nice job of catching this pair in the sunlight.